BOBBY DARIN. Singer, songwriter, multi-instrumentalist, actor in film and television. He performed in a range of music genres, including jazz, pop, rock’n’roll, folk, swing and country. He started in show business as a songwriter for Connie Francis and achieved world fame in 1958 with his own first million-seller “Splish Splash”. He died following a heart operation in 1973 at the age of 37. He was inducted into the Rock and Roll Hall of Fame in 1990, the Songwriters Hall of Fame in 1999, and the Recording Academy gave him a posthumous Lifetime Achievement Award at the 2010 Grammy Awards ceremony. It has been said that had he lived, he would have been more famous than Frank Sinatra. Darin was that multi-talented. 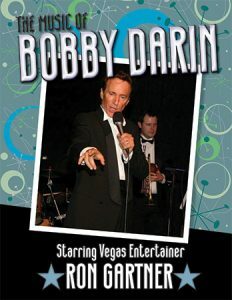 In this special show, Vegas entertainer Ron Gartner honors the Darin legacy… singing the songs of the swingin-est guy who ever put on a tux…in a show that covers everything from Darin’s rock ‘n’ roll days to the evening at the Copa (with a slight detour into Country, Folk and Political Activism). Finger-snappin’ songs like Mack The Knife, Dream Lover, Beyond the Sea, Artificial Flowers, If I Were a Carpenter, Clementine, That’s All, and many many more!